Claire Warnier and Dries Verbruggen are Unfold, a couple both professionally and privately, and they’ve really caught the eye in recent years with 3D printed ceramics. 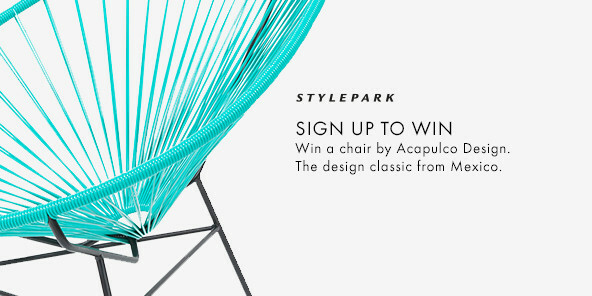 The two are graduates of the Design Academy Eindhoven and after their studies opened a studio in Antwerp. 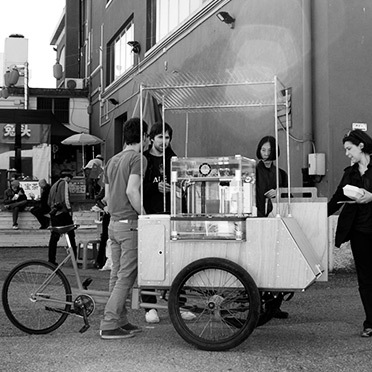 During Milan’s furniture week in 2011, they really got noticed with their project “Kiosk”: they travelled around the Ventura Lambrate design district transporting a 3D printer on a bike and printed objects on the spot. Their book “Printing Things. Visions and Essentials for 3D Printing” was recently published by Berlin’s Gestalten-Verlag. Martina Metzner interviewed Claire Warnier and Dries Verbruggen via Skype. Martina Metzner: Do you guys own any 3D printed objects that you use every day? Claire Warnier: That’s a good question. We use our ceramic objects every day. Dries Verbruggen: They’re things you don’t really notice, such as small brackets and connecting elements we need for exhibitions. They are all custom-made to suit our individual needs. We’ve also made children’s toys. 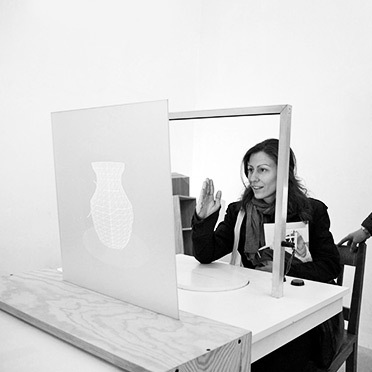 Or the things from our “kiosk” project, such as the copy of a plastic vase by Hella Jongerius (Claire Warnier holds the vase up so we can see it on-screen). What prompted you to print things from clay rather than plastic? And what advantages do you see over traditional manufacturing methods? Claire Warnier: Printing allows you to make objects with complex structures. What’s more we have an aversion to plastic, the world’s most used material. We tend to use it for prototypes. Clay is different, you finish up with a real product. Dries Verbruggen: Compared with customary ceramic cups there is no real advantage. Except that you can give them all a different design. As Claire just said we see the advantage in being able to make highly complex ceramic products. For example, last year we collaborated with French fragrance maker Barnabé Fillon and and created a series of ceramic perfume diffusers. The second object we’re working on is a clay water filter for developing countries. These are objects that could not previously be produced (in this manner). When did you develop your first ceramic printer? Claire Warnier: That was 2009, shortly after the first RepRap-printers became available. And we became interested in them and modified the device to make something else from it. Dries Verbruggen: Back in the 1990s when we were still studying we were interested in how you can transform a digital idea into an actual object. We wanted to meld old artisan techniques with digital technology. At the time 3D-printing was a rigid technology you did not experiment with. Do you believe that 3D printing can replace conventional manufacturing methods and, as you describe in the book, trigger a new industrial revolution? Claire Warnier: For two years we’ve been in a phase of intense experimentation with 3D printing, discovering new options all the time. We also wanted to document that in the book. But we don’t believe that at some point everyone will have a 3D printer at home, and will simply print out their own products. What’s more, I don’t believe such devices will replace the industrial methods that have developed in the course of the last century or so. Dries Verbruggen: At the moment there’s a large gap between specialized hand production, with output limited to just a few articles, and the mass production of items that are made in their millions. 3D printing will find its place in-between, and as such you can’t yet say that it will replace this or that. First we’ll see local 3D print outlets and consequently the increased production of individual objects in small numbers. Possibly, as a result the consumer mentality will change so that there are less mass-produced articles, and more products custom-made on demand. 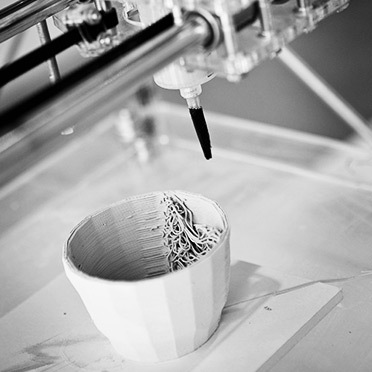 Let’s look into the future: How will 3D printing alter the design industry in the next 15 years? Claire Warnier: In five years there are bound to be more FabLabs and small print shops. Online platforms like Shapeways will become more important. In your book you describe a scenario in which designers provide ideas and are no longer creators of a standard product. If you reduce designers “only” to the idea, no longer able to influence manufacturing, the materials or the marketing, doesn’t that deprive them of a core skill? Claire Warnier: I believe it will give designers more options. Designers will not only offer software but equipped with a 3D printer can realize specific products on demand and market them directly. So designers still have an influence on the manufacture and choice of materials. Dries Verbruggen: Designers often have a lot of ideas that fail because they can’t find a manufacturer willing to realize them. That will change and shift towards consumers who take such decisions. Increasingly, consumers want to buy products that are not standardized, but tailored to them. 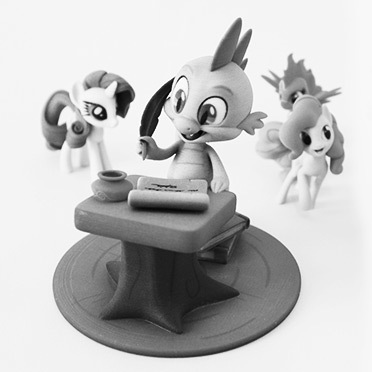 For example: Recently, toymaker Hasbro announced it was teaming up with Shapeways to print out toys like “My little Pony”, so individual designers can create new 3d printable content based on Hasbro's intellectual property. Hasbro will then earn on the license fees for the files. That means value added will be redistributed between designers, producers and consumers. That represents a big opportunity for 3D printing – and for designers, too. And consumers also prefer it when manufacturing methods are completely transparent. Most people print plastic, but you print clay. And materials including cement, pasta dough, gold, steel and even organic material have been used. For which material do you see the rosiest future? Claire Warnier: The material qualities of 3D printed products is not as good as for those products made in a conventional manner. In our view what will become more important is to be able to print and combine different materials simultaneously. In the end you have a product that unites two or more materials. Dries Verbruggen: Stratasys offers a Polyjet printer that can combine 46 different colors and three different materials. Currently, the problem of 3D printed materials is that they aren’t really durable and so don’t progress beyond the prototype stage, but the technology is developing at breakneck speed. Generally, we’re dwelling too long on whether 3D printing can replace a conventional manufacturing method. It’s a refinement of the additive manufacturing methods, which generates new product typologies because designers are developing products especially for 3D printing. Consequently, the materiality of the products will become less interesting than other product characteristics. Can you name these other characteristics? Dries Verbruggen: The thing is to combine conventional production methods with 3D printing, an example being the table by German-Swedish designer duo Kram/Weishaar or the “Keystones” table by Minale-Maeda. I don’t go along with the idea that 3D printing is a distinct process. We shouldn’t start thinking it’s a magic machine with which you can make everything, even an iPhone. This is an image traditional media like to conjure up. But it’s still a machine with advantages and disadvantages. And it’s still up to the designer to determine what can be done with this machine and what not.